Businesses looking to protect their networks, remove viruses, and scan for security risks in their system can look to Sophos for help. Sophos users have a suite of products at their disposal. There is Sophos Home for Macs and PCs, which brings business-trusted malware protection, antivirus, and web filtering technology to personal computers. Home networks can be fully protected by the Sophos XG Firewall Home Edition, which covers VPN, application control, traffic shaping, anti-malware, IPS, web security and URL filtering, as well as reporting and monitoring. Android and iOS devices can also be protected with Sophos’ Mobile Security solutions, all without adversely affecting battery life or performance. Issues with Windows-powered computers can be easily scanned and resolved with HitmanPro – Malware Removal Tool. Linux serves can be protected with the Sophos Antivirus for Linux Free Edition as it catches all threats, including those for Windows computers. Threats lurking on a computer can be tracked and eliminated with the Sophos’ Virus Removal Tool. Meanwhile, full security for the network, web, mail, and web applications of up to 50 IP addresses can be provided by the Sophos UTM Firewall software version. Home computers can be protected from malicious apps, viruses, malware, and ransomware with the Sophos Home for Macs and Windows PCs. Phishing attacks and unwanted web content can also be blocked by this module. Mobile Android devices can also be protected from unwanted apps and online threats with Sophos Mobile Security for Android. Malicious content hidden in QC codes can also be dealt with by the Secure QR Code Scanner. Features such as the remote lock protect users against device loss and theft. Multi-factor authentication is also made possible by an Authenticator that manages one-time passwords. Privacy and Security Advisors also make sure that devices are secure. Users can run scans that eliminate Trojans, viruses, malware, spyware, and rootkits with the HitmanPro – Malware Removal Tool. A free second opinion scanner also ensures devices are thoroughly scanned by identifying issues that the initial scan may have overlooked. 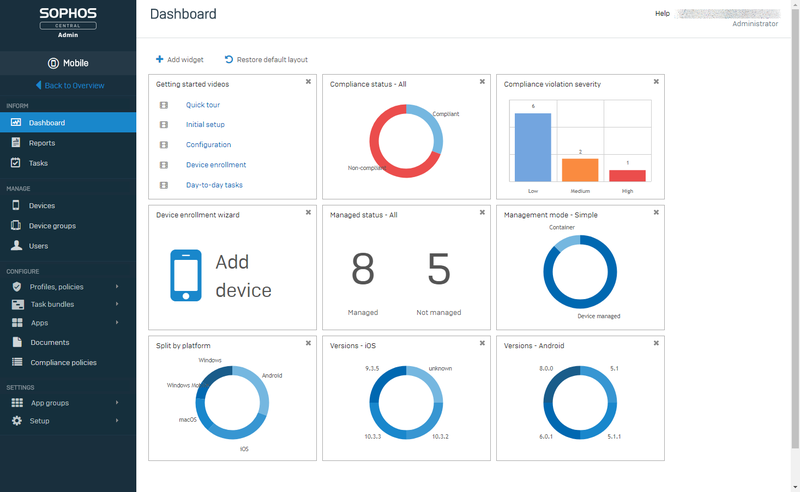 Users can gain a deeper understanding of the security benefits of the most current iOS upgrade with Sophos Mobile Security for iOS’ OS Version Advisor. Just as with the Android version, this also comes with a Secure QR Code Scanner and an Authenticator. Home networks can be fully protected with the Sophos XG Firewall Home Edition. Tools that come with this module include VPN, web security and URL filtering, application control, anti-malware, traffic shaping, IPS, and reporting and monitoring. Sophos’ Virus Removal Tool works alongside any antivirus software a user may already have, and can easily find and dispose of fake antiviruses, Conflicker, viruses, rootkits, and other threats in a computer. With the Sophos UTM Firewall software version, up to 50 IP addresses can be provided with VPN functionalities and full web, mail, network, and web application security. The Sophos UTM Firewall software version comes with its own operating system, that overwrites the data on the computer when installed. Linux users can also turn to Sophos Antivirus for Linux Free Edition to protect their servers and prevent even Windows-intended threats from attacking the system. There is no danger of slowing down Linux servers as the module is kept light and easy. It can scan on schedule, on-access, or on-demand, working seamlessly in the background. Users can even upgrade it for centralized management and support. There is currently no information available regarding integrations with Sophos.